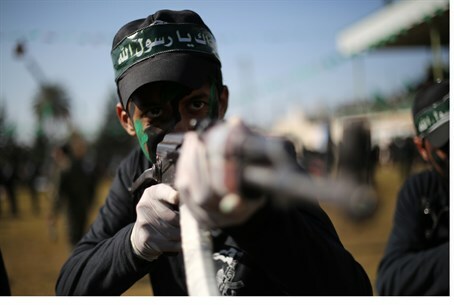 Hamas sources reveal indirect talks via UN and European parliament to extend ceasefire, confirming Arab media reports. Israel and Hamas have been holding indirect contacts about ideas for cementing a long-term truce in Gaza, sources in the terrorist group said Tuesday, in confirmation of reports about secret talks from last month. The contacts have gone through a number of Arab and European channels in a bid to firm up an informal ceasefire agreement that took hold last August, ending a 50-day war in Gaza started when Hamas escalated its rocket attacks on Israeli civilian centers. "There has been indirect contact between Israel and Hamas, messages passed via Arab channels as well as through European and Turkish sources," one of the sources told AFP, describing it as "an indirect exchange of ideas." The Egyptian-brokered truce came into effect on August 26, with the sides pledging to resume indirect contacts within a month to pin down a lasting ceasefire and discuss crunch issues. But the follow-up talks were delayed several times and never formally resumed. "We are ready for an agreement. Hamas wants to solve the problems in Gaza," the source said. But he insisted the contacts were purely informal and that there was no formal initiative or proposal on the table. "Hamas has received some European envoys in Gaza and Doha with messages from Israel," he said. "We received several envoys but it's not officially talks. It's indirect ideas and communication." He noted the involvement of a UN official as well as members of the European parliament. Senior Hamas officials had met in Doha over the weekend for talks with the Qataris, he said in confirmation of reports earlier on Tuesday, while denying remarks attributed to a senior Hamas official which suggested there was a written proposal under discussion. He said the discussions were about an agreement of five to 10 years, and focused on key issues for Hamas such as ending Israel's "blockade," which has been allowing hundreds of trucks with materials in every day, and the establishment of a sea passage between Gaza and the outside world that Israel has firmly rejected so as to prevent the influx of weapons certain to follow from the move. He did not say whether other Palestinian Arab factions were involved in the talks, such as the Fatah movement of Palestinian Authority (PA) chairman Mahmoud Abbas which was heavily involved in the Egyptian-brokered talks that ended the conflict. Even as it negotiates an extension of the ceasefire, Hamas has been secretly rebuilding its terrorist attack tunnels into Israeli territory and developing its domestic rocket arsenal for its next attack against Israel; last summer's war was the group's third attempt to destroy the Jewish state.